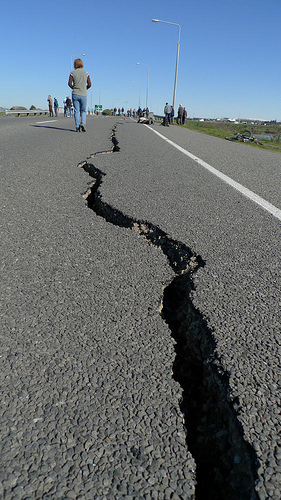 Earthquakes , or the Antichrist? Many Bible teachers say that there will be earthquakes and wars before Jesus Christ returns for his Church. They say that these signs are the beginning of sorrows mentioned in Matthew 24:8. Well hold on just a minute. Are these signs meant for the Church or are these signs meant for the nation of Israel? In Matthew 24 Jesus is asked the question “what shall be the sign of thy coming?” Which coming is he describing? Is he describing his coming to gather Church age believers, or is he describing the period before he comes to rescue the nation of Israel and set up his throne in Jerusalem? First it is important to understand who Jesus is talking to. He is talking to his disciples. It is important to note that they are all Jewish. They are all looking forward to God establishing his kingdom on earth. It is also important to note when the message was given. It was given by Jesus before his death, and before the gospel was preached to the gentile nations. This message was given before the Church was established. Then it is important to carefully examine the message itself. Are there clues to which group of people Jesus is prophesying about? Yes, there are very clear indications that Jesus is prophesying about the trails of the Jewish people during the Tribulation period. As a matter of fact Matthew 24:21 is the verse where we get the term great tribulation. So Matthew 24 should not be used to illustrate the signs of the Rapture of the Church. Also Matthew 24 should not be used to prove that the Church will participate in the Tribulation period. The gospels are very important since they record Jesus Christ’s genealogy, standards of righteousness, forgiveness of sin, miracles, fulfillment of Old Testament prophecy, and Christ’s death as payment for the worlds’ sin. The message of the four gospels is to be understood by Church age believers. We should also understand that most of Jesus’ teaching, parables, and prophecy are specifically directed to the nation of Israel. Jesus was sent especially to seek and to save the lost sheep of Israel. Mat 10:5-6 These twelve Jesus sent forth, and commanded them, saying, Go not into the way of the Gentiles, and into any city of the Samaritans enter ye not: 6 But go rather to the lost sheep of the house of Israel. It is sometimes difficult to know who is being addressed in the New Testament. Is Jesus talking about the nation of Israel or is he talking about the Church? A rule of thumb is that Jesus was sent to the Jews first and primarily. The gospel of the coming kingdom of God was preached first to the Jews and then to the Gentiles. Jesus primarily taught the nation of Israel. The four gospels were written about Jesus’ life and ministry. They primarily address the nation of Israel. Of course, there is plenty of teaching to be absorbed by Church age believers. The disciples taught the Jews first and then the other nations. The Gospels typically address Israel. The epistles (or letters) to the Churches were written specifically to Church age believers! Let’s take a quick look at Matthew 24. I know that preachers and prophecy buffs like to identify natural disasters as signs of Jesus’ return for his Church, but these signs were provided for the nation of Israel during the first half of the seven year Tribulation period. They are signs that happen before Israel’s time of trouble. They happen well before Jesus Christ’s second coming to defeat Israel’s enemies and to set up his throne in Jerusalem. Matthew 24:4 And Jesus answered and said unto them, Take heed that no man deceive you. 5 For many shall come in my name, saying, I am Christ; and shall deceive many. 6 And ye shall hear of wars and rumours of wars: see that ye be not troubled: for all these things must come to pass, but the end is not yet. 7 For nation shall rise against nation, and kingdom against kingdom: and there shall be famines, and pestilences, and earthquakes, in divers places. 8 All these are the beginning of sorrows. So who is Jesus talking about? As we will see, “the beginning of sorrows” in verse 8 above are not signs that Church age believers should be on the lookout for, instead, they are events that will happen during the first half of the Tribulation period. Jesus is talking to and about the nation of Israel here. In verse 9 below, Jesus tells his Jewish disciples that “ye shall be hated of all nations”. The word translated “nations” is the Greek word “ethnos”. It is often translated as “gentile”. Ethnos refers to non-Jewish nations. It doesn’t refer to all nations in the world. It refers to all families or people groups. In practical terms it refers to the old world nations that came from specific families; like the Greeks, Turks, Egyptians, Syrians, Iranians, Saudis, Jordanians, and many more. So in verse 9 Jesus isn’t saying that Church members will be hated, but that the entire nation of Israel will be hated by all of the surrounding nations. Matthew 24:9 Then shall they deliver you up to be afflicted, and shall kill you: and ye shall be hated of all nations for my name’s sake. 10 And then shall many be offended, and shall betray one another, and shall hate one another. In the verses below, Jesus isn’t addressing the Church, but he is warning Jews during the 7 year Tribulation period. Many Jews will disregard God and his promises to Israel. Many Jews will be killed. But those who trust God to the end will be saved. Please read my commentary titled “The Last Jews in Jerusalem” in my book “Israel’s Beacon of Hope”. Matthew 24:11 And many false prophets shall rise, and shall deceive many. 12 And because iniquity shall abound, the love of many shall wax cold. 13 But he that shall endure unto the end, the same shall be saved. In Matthew 24:14 below we can see that Jesus is talking about the Tribulation period. The Tribulation period is a seven year span designated for God to show his displeasure with Israel’s rejection of him. In Matthew 24:14 the gospel is preached in all the world. This happens during the Tribulation period as described in Revelation. So we can see that Jesus is addressing people that are living during the Tribulation period. The following verses are obviously addressed to Jews living around Jerusalem. The inhabitants of Judea (the region around Jerusalem) are called by name in verse 16. So it is very clear that Jesus is describing the coming trials of the nation of Israel, and not the signs of the rapture of his Church. If that isn’t enough evidence that Jesus is describing Israel’s Great Tribulation, then look at Matthew 24:21 below. This is the verse that we get the term “Great Tribulation” from. Today the Church is suffering at the hands of the nations, but the nation of Israel is scheduled to suffer 7 years of tribulation. In Matthew 24 Jesus is explaining the trials that Israel will suffer during the Tribulation period. The beginning of sorrows in Matthew 24:8 are the events of the first part of the Tribulation. After the abomination of desolation in Matthew 24:15 the worst part of the Tribulation begins (Dan 9:27). It is called “great tribulation” in Matthew 24:21. The second part of the Tribulation lasts 3 ½ years or 42 months or 1260 days (Dan 7:25, Dan 12:7, Rev 11:2-3, Rev 12:6, Rev 12:14, Rev 13:5). The Tribulation period is designated to exercise God’s indignation towards the nation of Israel, it is not meant not for trying the Church. The 7 year Tribulation period is the same as the seventieth week prophesied by Daniel (Dan 9:24). It is a 7 year period of trouble for the nation of Israel, not a time for trying the Church. Jeremiah calls the Tribulation “the time of Jacob’s trouble” not the time of the Church’s trouble. The seven year long Tribulation period is designated for Israel’s chastisement. 1Th 4:16 For the Lord himself shall descend from heaven with a shout, with the voice of the archangel, and with the trump of God: and the dead in Christ shall rise first: 17 Then we which are alive and remain shall be caught up together with them in the clouds, to meet the Lord in the air: and so shall we ever be with the Lord. The gathering of Jewish believers will happen differently. Below, the elect are God’s chosen people (Deu 7:6). They are the people of Israel that have been scattered throughout the world by every past world empire. The people of Israel will be raised from the dead at the end of the Tribulation period. They won’t be taken into the sky. They will walk back to the land of Israel on foot. Isa 11:11-12 And it shall come to pass in that day, that the Lord shall set his hand again the second time to recover the remnant of his people, which shall be left, from Assyria, and from Egypt, and from Pathros, and from Cush, and from Elam, and from Shinar, and from Hamath, and from the islands of the sea. 12 And he shall set up an ensign for the nations, and shall assemble the outcasts of Israel, and gather together the dispersed of Judah from the four corners of the earth. God will make a roadway for the Hebrews to return to Israel. In Isaiah 11:15-16 below, Jesus dries up the Gulf of Aqaba on the Red Sea (that is the tongue of the Egyptian sea)! He will also dry up the Nile, Euphrates, and Tigris Rivers in order to make a way for the resurrected Hebrews to cross over them! Please read my commentary titled “Aliyah Israel Arise Return” in my book “The Last Jews in Jerusalem”. Isa 11:15-16 And the LORD shall utterly destroy the tongue of the Egyptian sea; and with his mighty wind shall he shake his hand over the river, and shall smite it in the seven streams, and make men go over dryshod. 16 And there shall be an highway for the remnant of his people, which shall be left, from Assyria; like as it was to Israel in the day that he came up out of the land of Egypt. OK we have looked at the signs that happen before Jesus comes back to gather Israel. So what are the signs that happen before of Jesus comes back to gather his Church? Well there isn’t one specific event that triggers the Rapture but we are instructed to understand Old Testament prophecy in order to recognize the Tribulation as it approaches! We will know that the Rapture is near because the Rapture will happen before the Tribulation. In 2 Thessalonians below, Paul is addressing the Church in Greece. Paul calls them brethren in Christ. So Paul is describing the Rapture of the Church in verse 1. The believers in Thessalonica were worried that the Tribulation was beginning. They were worried that the Rapture had not yet happened! Paul told them that two Old Testament prophecies must take place before Jerusalem’s great tribulation began. Those two events were the falling of Satan from heaven to earth and the revealing of the Antichrist with signs and wonders. I think that these two events may happen before the seven year Tribulation period begins. Since they had not yet happened Paul was assuring the Thessalonians that the Tribulation had not yet begun. Paul was assuring the Thessalonians that when the time came they would escape the terrible time of trouble on earth. Please read my commentary titled “The Fall of Satan and Rise of the Antichrist” in my book of the same title. In 2 Thessalonians 2:13-14 below, Paul says that the church members in Thessalonica will be saved from the coming tribulation. The word “salvation” in verse 13 isn’t describing deliverance from sin, but it is describing physical rescue from God’s wrath on earth during the Tribulation. 2Th 2:13-14 But we are bound to give thanks alway to God for you, brethren beloved of the Lord, because God hath from the beginning chosen you to salvation through sanctification of the Spirit and belief of the truth: 14 Whereunto he called you by our gospel, to the obtaining of the glory of our Lord Jesus Christ. Here are two other verses that indicate that Church age believers will escape from the wrath of the Tribulation period. These people have already been saved from sin. The term salvation here is the rescue from physical harm during the Tribulation on Earth. Rom 5:7-10 For scarcely for a righteous man will one die: yet peradventure for a good man some would even dare to die. 8 But God commendeth his love toward us, in that, while we were yet sinners, Christ died for us. 9 Much more then, being now justified by his blood, we shall be saved from wrath through him. 10 For if, when we were enemies, we were reconciled to God by the death of his Son, much more, being reconciled, we shall be saved by his life. Again physical rescue or “salvation” comes to people who already believe! If you are still on earth when you see most of the old world nations at full scale war with each other and also hear of famines, and disease outbreaks, and earthquakes happening all over the world, then you are in trouble. You have entered the beginning stages of the Tribulation period. It is High Time to Awake!